From Estreham Road the path crosses under the railway lines by Potters lane and enters into Conyers Road. The building in photo 1 originally belonged to the Southwark and Vauxhall Water company and is now the Thames Water Ring Main Shaft 6th Pump. A little further on down Conyers Road I bumped into someone I used to know from work but has since gone back to University who was out delivering leaflets on behalf of his partner who is standing in the local council elections which was a suprise to say the least. It was very odd to think that both of us had ended up in the same side road in Streatham at the same time on a Sunday morning in a city the size of London, particuarly as neither of us live there. It reminded me of last year when I was walking a very remote section of the Cornish coast path past Port Issac where I also met someone from work walking in the opposite direction, one of only five or six people I passed during the entire walk. From Conyers Road the path passes into Riggindale Road and up to Tooting Bec Road where the path turns left along the road to pass the Tooting Bec Lido and then cross Tooting Bec Common. 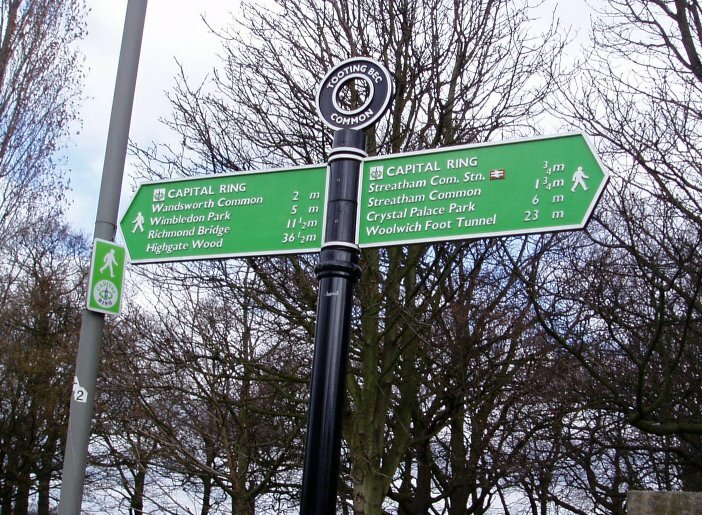 A Capital Ring fingerpost at the start of the common, photo 2, showed it was now 11 1/2 miles to Richmond Bridge. There were a number of Sunday football matches being played as I went past, something I see a lot of when out walking in London although the match in photo 3 was stoppped due to an injury to a player. The path leaves Tooting Bec Common, photo 4, and heads through a number of residential side streets to eventually reach the busy Balham High Street, close to Balham Station and the church of St Mary and John the Divine, photo 5. The route of the path crosses the High Road and heads down Balham Park Road before a passage leads off to the right between houses and into the Wandsworth Common, photo 6. Wandsworth Common is split into a number of different sections, photo 7 was taken close to Wandsworth Common Station. The Capital Ring then crosses over Bellevue Road where Wandsworth Common continues, photo 8. This section of the common contains a couple of ponds, photo 9. A little further on I stopped at a bench on the common and had my sandwiches under the watchfull eye of a crow which kept approaching for a handout. Photo 10 is the view from where I sat, the route of the path curves off to the left of the photo. The path leaves Wandsworth Common and crosses Trinity Road and heads up a side road past a pub towards Wandsworth Prison where the path turns left into Heathfield Road and then right into Magdalen Road, photo 11. Magdalen Road is a long straight stretch of road which is followed all the way to its junction with Garratt Lane by Earlsfield Station. For much of its length the road is flanked to the right by Wandsworth Cemetery. The Capital Ring crosses Garratt Lane which is followed for a short distance, under the railway lines to Penwith Road. In Penwith Road the path crosses the rather sad looking River Wandle, photo 12, before making its way along a number of suburban streets to the small Durnsford Road Recreation Ground and through a short passageway to Durnsford Road itself. Once on Durnsford Road the Capital Ring turns left and then right at Arthur Road where the path climbs uphill to the Wimbledon Park underground station and the end of this stage of the Capital Ring. The GPS made the length of this stage 4.84 miles long.